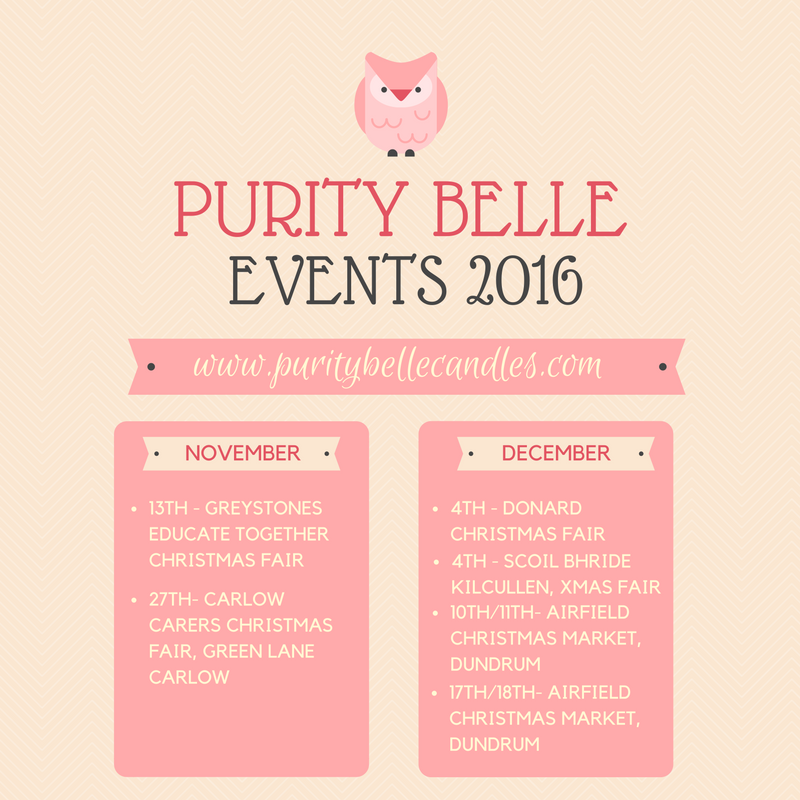 This is a short and sweet blog post just letting you all know about my Christmas Events and ordering info. for the upcoming season. Christmas Shop is open and I have all the old favourites like Christmas Spice, Orange & Cinnamon, Spiced Nutmeg and more. They are available in a range of containers and I hopefully will be adding more over the next while. Christmas season can be a bit chaotic and I'm doing lots of extra hours with the markets so I may not always be prompt with online shop updates. Do feel free to email and let me know if there is something you would like that isn't shown in the shop. Postage goes by An Post rates. Although I have not, at the moment, passed on the increased postal rates to my customers, I will unfortunately have to add them in the New Year, as postage has been costing me quite a lot lately! Just reading the words "Christmas Spice" on one of the candles had me feeling like I was actually smelling Christmas! Sadly, with allergies, scented candles are not great for me but I still get to buy them for my friends. The candles are so beautifully packaged! These are super cute and perfect for Christmas. It's so amazing you have this all going on! Ah these look great - I'm a massive candle fan! Good luck with your Christmas sales, hope they make it into lots of stockings! Things NOT to do when running a Craft Business.